Lawyer in Brazil. Partner at Sacha Calmon - Misabel Derzy Consultores e Advogados. Graduated in Law from UFMG. Master’s Degree and PhD in Tax Law from UFMG. Université de Nancy II: Diplôme Supérieur de d’Études Françaises (3e degré). Member of the Special Committee on Tax Law of the Federal Council of the Brazilian Bar Association. Scientific Director of Tax Law of the Brazilian Association of Tax Law (ABRADT). 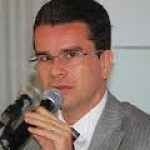 Director of the Brazilian Association of Financial Law (ABDF).